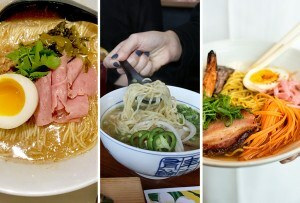 Buffalo ranch, ramen, and other unique flavors perfect for popping anytime. By Scott Kearnan·	 1/18/2019, 10:26 a.m.
Get your Michael Jackson gifs at the ready: National Popcorn Day falls on Saturday, January 19, according to whoever decides these things. Since ordinary Orville Redenbacher clearly won’t cut it on such a high holy day, we found a few more interesting options for noshing, from limited-time specials to standby bar snacks. 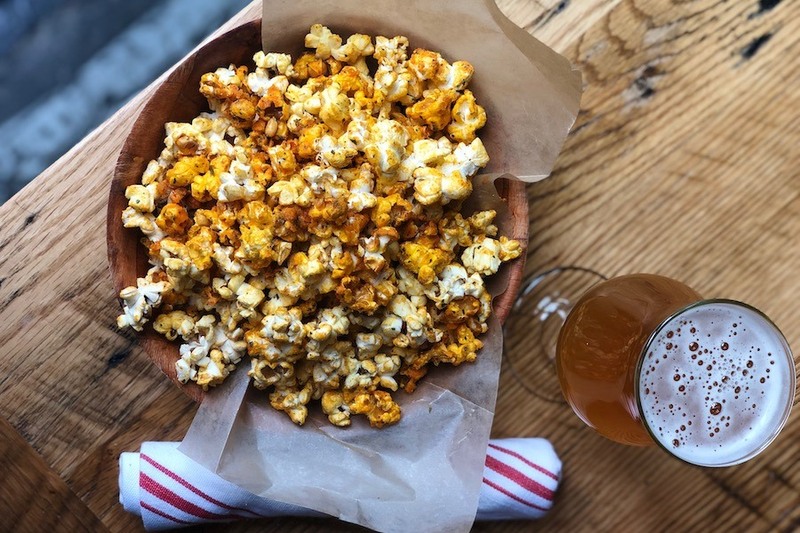 The Seaport location of this small chain of craft beer bars—which is based out of Philly—will be serving two specials on Saturday: snack-sized bowls of buffalo ranch popcorn (pictured above) and an entrée of popcorn-crusted popcorn shrimp with honey Sriracha dipping sauce. Both are perfect for pairing with something sudsy from the 100 variety-strong beer list. 10 Boston Wharf Rd., Boston, 617-904-2748, citytap.com. This swanky new movie theater saves some of its marquee names for the concession stand. Boston star chefs design monthly-rotating styles of gourmet popcorn, and through the end of January, you’ll find ramen popcorn—flavored with peanut oil, furikake, roasted sesame seeds and fried shallots—courtesy of Jamie Bissonnette (Toro, Coppa, Little Donkey). February brings cheesy garlic bread popcorn from Top Chef alum Tiffani Faison (Sweet Cheeks, Tiger Mama, Fool’s Errand), whose dramatic turn from reality-show villain to popular restaurateur got the feature-length treatment in our latest issue. 60 Seaport Blvd., Boston, 617-444-6677, showplaceicon.com. Belly up to the bar at this Boston-born brand of Italian steak, seafood and pasta spots, grab a glass of red wine, and wash down popcorn that is tossed with Parmigiano and crispy bits of pancetta, then sprinkled with sea salt. Pinkie rings out. 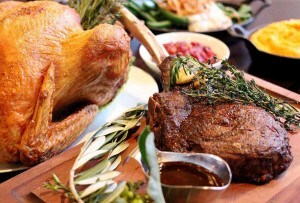 75 Arlington St., Boston, 617-357-4810, davios.com. Okay, okay. The popcorn itself is pretty plain. But polite applause, please, for its use as a gimmicky garnish at the Ghost Walks, a neon-lit Theater District restaurant-lounge. 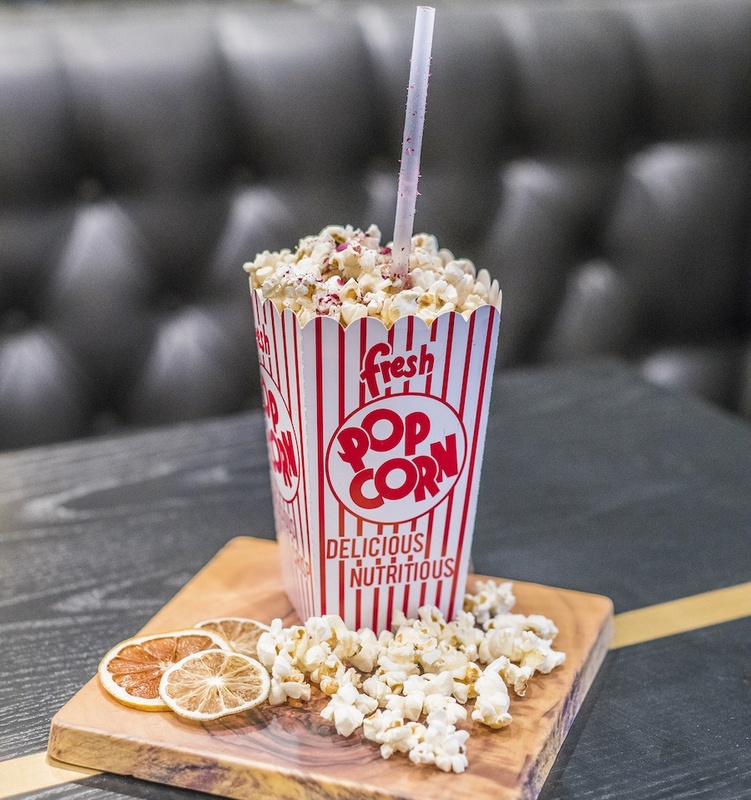 The Box Office—a bourbon cocktail with butterscotch, chocolate wine and blood orange—is served in an old-school popcorn sleeve overflowing with kernels. 57 Stuart St., Boston, 857-263-8932, tgwboston.com. Starting on Saturday, chef Sean Dutson will start tossing out some tongue-tingling popcorn as a complimentary bar snack at this New England cuisine-inspired restaurant inside the Revere Hotel Boston Common. It’s a spicy-sweet combo for munching over cocktails like the Midnight Ride: ghost pepper-infused tequila with lemonade and blueberry syrup. 200 Stuart St., Boston, 617-457-2625, reverehotel.com. Kane’s, a cult-fave donut shop known for occasionally outlandish varieties, teamed up with Salem’s Popped! Gourmet Popcorn to create this treat, available only on Saturday. 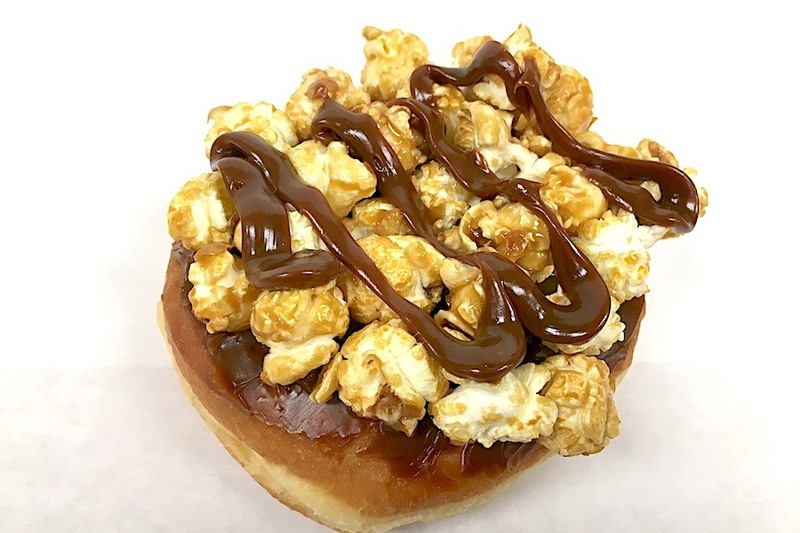 The yeast-style donut is glazed with caramel frosting and studded with sea salted caramel popcorn. Visit the Popped! 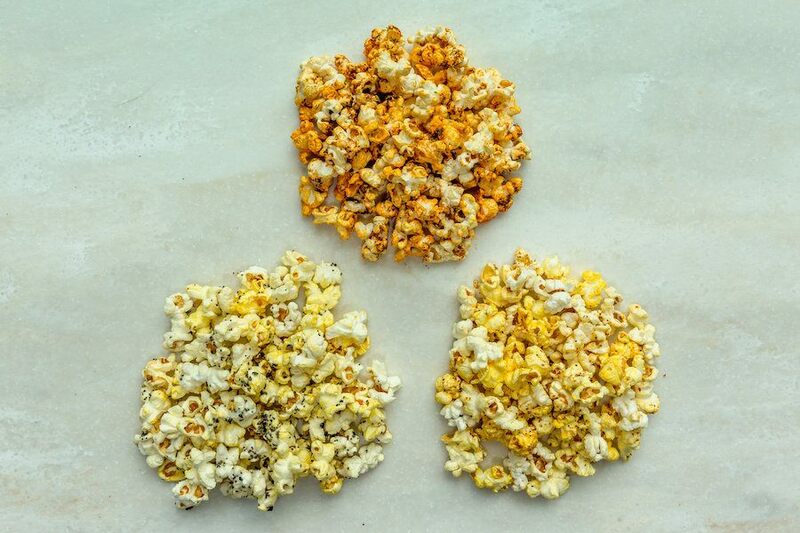 shop in the Witch City to find quirkier popcorn flavors like pizza, birthday cake, and PB&J. 90 Oliver St., Boston, 857-317-2654; 120 Lincoln Ave., Saugus, 781-233-8499, kanesdonuts.com. Opened in September, this subterranean spot in Harvard Square replaced Beat Brasserie with a beer-soaked destination for dinner, drinks and live music. Toss back handfuls of sweet-and-spicy popcorn while catching acts like Saturday’s performer, soulful Mozambique-born artist Albino Mbie. 13A Brattle St., Cambridge, 617-499-0001, beatbrewhall.com. 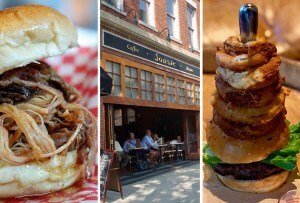 The downtown gastropub has a semi-legendary bar snack in its Cracka Jack, an addictive offering of caramel-covered popcorn with bacon and roasted peanuts. And yes, there’s a sweet little surprise at the bottom. 21 Temple Pl., Boston, 617-338-5333, jmcurley.com. Chef Benjamin Lacy has revamped the bar menu since joining the team at this Kendall Square-side restaurant less than a year ago, adding ideas like popcorn tossed in tallow (rendered fat) and ranch powder. The spot stresses art and science education through regular exhibitions, lectures and panel events, and the current cocktail menu will have you noshing over drinks named for endangered species— like the Pika: Scotch, ginger and honey and lychee foam sipped out of a ceramic bowl. 650 E Kendall St., Cambridge, 857-999-2193, cafeartscience.com.